Assemblymember Bing, speaking at Marymount Manhattan College, successfully passed legislation this year that would provide cultural and educational institutions the ability to save important programs and jobs. During the economic downturn, many cultural and educational institutions have been forced to make tough decisions regarding cuts to programs, scholarships, and jobs due to highly restrictive laws governing endowments in New York State. Assemblymember Bing introduced legislation this year that would update a 35-year-old law and provide more flexibility in how non-profits can use their endowments, and would preserve the ability of these institutions to continue to serve New Yorkers. Bing’s legislation will provide long-term protections against future economic downturns, allowing institutions to keep programs running and scholarships paid through tough economic times. Assemblymember Bing’s legislation is supported by over 60 universities and cultural educations around the state, including New York University, the Metropolitan Museum of Art, and Yeshiva University. This bill has passed both house of the Legislature, and awaits the Governor’s signature. Assemblymember Bing has worked during his tenure in the Assembly to provide funding for arts and cultural programs. 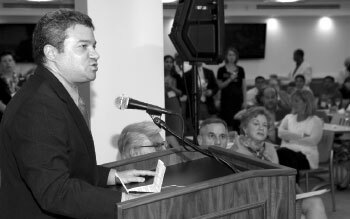 This year, Assemblymember Bing announced that legislation he authored to provide additional resources to the New York State Council on the Arts (NYSCA) passed the Assembly. This legislation would allow taxpayers to make a gift to NYSCA through a simple “check-off” on their State tax return. This no-cost administrative step would increase funding for NYSCA without putting additional strain on State funds. In the wake of this year’s budget cuts to NYSCA, Bing’s legislation would provide much-needed additional support for arts organizations in New York. This legislation has passed the Assembly every year since 2004. New York State becomes the last state in the country to permit no fault divorce. In attempt to bring New York State’s divorce laws in line with every other state in the country, Assemblymember Bing introduced legislation sponsored by 65 of his colleagues to allow for “no fault” divorce. Currently in New York, a divorce can only be granted by alleging fault such as cruel and inhuman treatment. This often makes a difficult situation more contentious, especially if children are involved. No fault divorce would permit a divorce judgment to be granted to a couple without assigning blame on one party or the other. Assemblymember Bing’s legislation would allow a no fault judgment only after all other issues surrounding the divorce have been resolved, including spousal and child support and visitation rights, and would not eliminate any existing grounds for divorce in New York State. This bill has passed the Legislature and awaits the Governor’s signature. Assemblymember Bing has led efforts to assist the businesses that have been negatively affected by Second Avenue Subway construction. In 2010, the Assembly passed Bing’s legislation to create a grants program for these struggling businesses. The Second Avenue Subway continues to be a priority for Assemblymember Bing, and he has worked hard to mitigate the effects of the construction on surrounding residents and businesses. In March, the Assembly passed legislation authored by Assemblymember Bing to create a Second Avenue Subway small business grant program for businesses suffering due to ongoing construction. This is the third time since 2008 that Bing’s legislation has passed the Assembly. 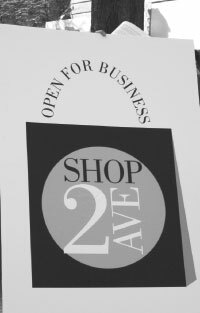 The grants program would aid small businesses along Second Avenue by providing matching funds for capital improvements and marketing costs to bring back consumers, as well as for payroll, rent, and business counseling assistance. Many businesses have closed or experienced large decreases in business activity as a result of construction. Assemblymember Bing also helped establish a task force to assist these businesses during the construction period. The task force continues to meet on a monthly basis to discuss ongoing issues. Last month, the NYC Department of Transportation and the MTA began implementation of Select Bus Service on the East Side along First and Second Avenues. The first phase of the bus service will include curb or offset bus lanes from Houston to 125th Streets, off-board fare collection and enhanced stations at all SBS stops, and new low-floor, three-door, articulated buses. Assemblymember Bing authored the legislation recently adopted in the 2010-11 fiscal year transportation budget which will allow for the SBS buses and bus lanes to be equipped with cameras to assist with enforcement, and reduce congestion and pollution along these bus routes. Assemblymember Bing’s efforts to advance the bus lane camera issue were strongly supported by Transportation Alternatives, Straphangers Campaign and the New York League of Conservation Voters. 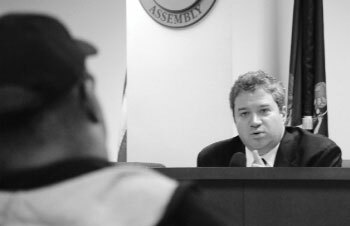 Assemblymember Bing at an Assembly hearing he hosted on disabilities housing. In 2010, Bing passed two important bills on housing for people with disabilities. As former Chair of the Assembly Legislative Task Force on People with Disabilities, Assemblymember Bing has led efforts in the Assembly to protect disabled individuals. He continued those efforts in 2010 with two bills he authored to prevent discrimination and increase access to housing for people with disabilities. Earlier this year, Bing introduced legislation to give State agencies enforcement capability over Federal laws regarding housing for people with disabilities. Currently, Section 504 of the Federal Rehabilitation Act requires that housing developments financed with federal money provide accommodations for individuals with disabilities and make efforts to advertise these units to this population. Assemblymember Bing also introduced legislation to prohibit discrimination by landlords on the basis of a tenant’s source of income. Currently, landlords may reject tenants with rental subsidies, such as Section 8 vouchers, merely because tenants intend to use them for payment of rent. Many people with disabilities rely on those subsidies and other assistance programs to live independently in the community. Both bills have passed the Legislature and await the Governor’s signature to become law.